The dangers of foreign exchange risk are well understood in energy markets given the prevalence of commodity exposures denominated in foreign currencies. But despite this it is not unusual for residual foreign exchange exposure to be the Achilles heel of an otherwise effective risk management framework. Problems typically arise not from a failure to recognise the exposure in the first place but from residual risks that arise during exposure management. There are two key business processes associated with Foreign Exchange management: (1) foreign exchange exposure hedging and (2) foreign currency balancing. Typically (1) is of most interest to traders and asset managers and (2) is the concern of a central Treasury function. Foreign exchange exposure management is a critical part of effective asset and contract hedging. The calculation of the initial exposures and the resulting hedge requirement are typically part of the deal execution process. In most companies these exposures are transferred to a central Treasury function which aggregates exchange rate exposures and transacts in the foreign exchange market as a single market facing entity. The Treasury function is also normally responsible for ensuring cash balances in different currencies are managed and bought back to the corporate reporting currency without residual risk from unrecognised exposures. These two processes are inextricably linked, particularly for more complex asset hedging where it is important to both manage the currency exposures associated with the hedge as well as ensuring the correct spot currency balances reflect the resulting cashflows required for trades settling in different currencies. Residual foreign exchange risk issues are most common due to a breakdown of the interface between the commercial teams (trading desks or asset managers) and the Treasury function. Misalignment of the timing and frequency of hedging and re-hedging commodity and currency exposures can create unintended risk. For example, a trading book may be delta hedging an interconnector on a daily basis but the Treasury function is only re-hedging the changes in currency exposure on a weekly basis. A lack of clarity as to who is responsible for managing currency exposures as they unwind after initial hedges are put in place can also cause issues. Some of the problems with residual foreign exchange risk are best explored using a practical case study. Oil indexed gas contracts provide a comprehensive example of the risks and activities associated with foreign exchange exposure and cashflow management. 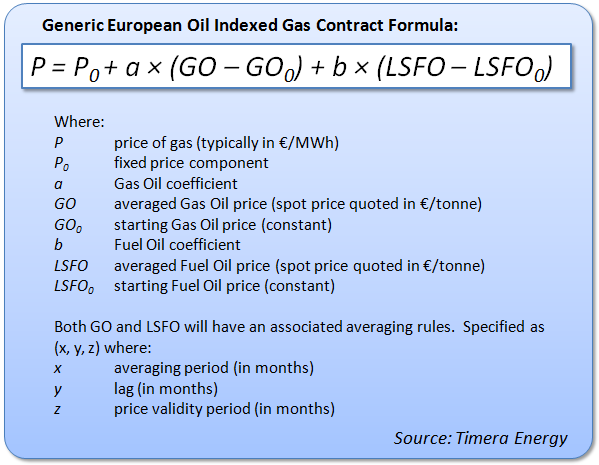 While there are a number of detailed terms and conditions specific to every European oil indexed gas contract, the generic structure across most of the contracts is very similar as illustrated in Diagram 1. The contract structure above creates an exposure to fuel oil and gas oil proportional to the coefficients a and b respectively. The fuel oil and gas oil prices averaged in the formula are specified in EUR/tonne but the underlying market price for these contracts is quoted in USD/tonne so there is also a EUR-USD exposure. Complication can occur when there is any optionality in the asset or contract as the FX exposure will be dynamic and change with commodity deltas. This can be difficult for models and risk management systems to capture effectively but failing to do so can result in unwelcome residual exposures. Hedging the price risk associated with an oil indexed gas contract involves a number of activities that interact with foreign exchange management. These activities are illustrated for a contract with a price that resets monthly based on a 1 month average with zero time lag as illustrated in Diagram 2. After the deal is concluded the oil and FX exposures will be hedged. The oil exposures relating from oil indexed gas contracts are hedged using USD denominated oil product swaps and EUR-USD forward hedges (in effect synthesising an oil hedge denominated in EUR). As the oil spot prices are generally averaged over a lagged period the oil exposure drops off before the gas delivery period. This is mirrored by the fixing in of the oil swap but to effectively hedge these contacts it is necessary to unwind FX hedges through-out the averaging period. A USD balance equal to the final value of the oil swap (which could be positive or negative) will be required for on the final settlement date. 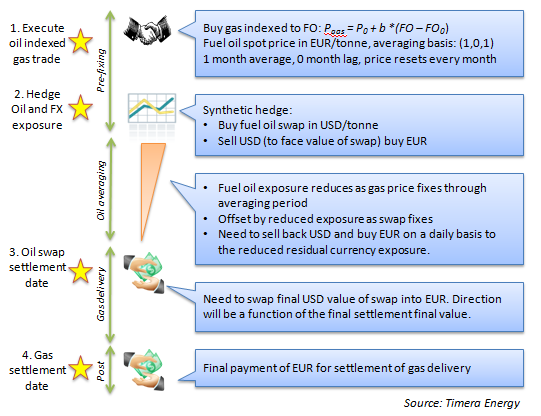 A lack of real time co-ordination between business functions will result in residual currency exposure remaining which could lead to the complete erosion of any margin that was generated from the original gas trade. One of the features of renewed turmoil in financial markets across the last few weeks has been a sharp increase in foreign exchange volatility. In this environment, understanding the impact of exchange rates on asset and contract exposures is central to the effective management of value and risk as we explore in more detail here. But failing to recognise residual foreign exchange exposures can result in a business ‘bleeding’ value, often without this being explicitly recognised in business performance measures such as trading P&L.